I am back at Holy Apostles College and Seminary after 8 months in California. We mostly have a very beautiful English Mass. 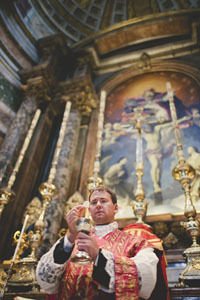 The Canons Regular of St. John Cantius, priest and seminarians, who teach and study here, as well as providing the music, also offer the Tridentine Mass certain weekdays and classes are offered also for all who want to be instructed in that Mass. So, Saturday morning was my first time after a long time, to come to that Latin Tridentine Mass. As usual, I felt wafted into the sacred by it – able to be lifted out of my world into the world of the Christ. Besides, this time, however, I had a strong experience of how the Mass purifies the heart. As those of you familiar either with me personally, or with my writings, surely know, my heart is often a turbulent mix of anxiety, anger, yearning to be liberated from self-created knots, impasses, ad nauseum. Moving around quite a lot to different places often exacerbates these tendencies as fresh stage-sets are provided for self-expression! (Smile). What came to me so clearly after that first Tridentine Mass, here at the seminary, was how its austerity of noble transcendence purifies the heart. Just before my mother was baptized, at age 60, coming from a totally atheist background, she asked what the word salvation meant. “What do we have to be saved from?” My spontaneous answer was, “From ourselves, of course.” I didn’t mean the wonderful side of ourselves, including myself: our human nature, tainted but created good; our yearning for the graces of joy, love, and gratitude, that the Savior pours into us. I meant precisely that we need to be saved not only from sin but also from this awful tangle of unredeemed emotions. The book of Kierkegaard, Purity of Heart is to Will One Thing, explains that most of the time our will is divided. We will only to do God’s will with part of our heart, but with the other we say, in effect, “Yes, I want God’s will but also…a comfortable life, fame, fortune…etc. etc.” And, therefore, we don’t find peace. Yes, we are to bring all our anxieties to God at Holy Mass, but let us let Him lift us above into the peace of the kingdom of heaven, so that we can go forth to bring not our unredeemed selves to others, but His love.